I could not wait to learn how to make homemade cake recipes when I was young. There is just no comparison between these and those which are purchased or even made from boxes. The taste of homemade far exceeds any other, and with the huge variety of recipes, there is something to please everyone’s taste buds. Of course there are some simple steps when learning how to make homemade cake recipes to ensure that your cake will turn out to be of great quality. 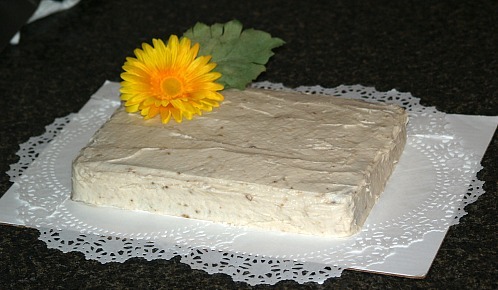 The most important in cake making lies in the quality of your ingredients; good quality produces a good quality cake. Reading the recipe thoroughly is of utmost importance. Measure your ingredients accurately. Following the method of combining and mixing the ingredients in your recipe makes a difference in your baked cake; so follow directions in the recipe. You may think that the mixing doesn’t matter so you throw everything in and then mix it altogether. When you are learning how to make homemade cake recipes believe me it will make a big difference in the results you get. Once you have gotten down the procedure of make good homemade cake recipes, I am sure you won’t want any others. You will learn that you can adjust some ingredients in basic recipes to achieve the extra taste which you like. You will learn that some ingredients add more moistness or other little tips of cake baking. The simple cake recipe below is a basic vanilla flavored cake but with the added baked brown sugar coconut icing; the cake takes on a whole new delicious flavor. I love the flavor of coconut but you could substitute the coconut with pecans or just use your imagination. Cream butter and sugar. Add eggs, soda, spices and buttermilk. Add flour and blend well. Fold in the sliced bananas and dump batter into a greased and floured 9x13 inch baking pan. Bake for 35 to 40 minutes or until a pick comes out clean. Mix well and pour onto hot cake. Sprinkle with coconut and return to oven to brown coconut. Preheat oven to 350F degrees; Grease and flour 9 X 13 inch baking pan. In a bowl sift together sifted flour, baking powder, baking soda and salt. Cream together butter and sugar; add eggs beating well. Beat in bananas; add flour mixture and buttermilk alternately while mixing. Stir in pecans; spread evenly in prepared pan. Bake about 50 to 55 minutes; frost with favorite icing. NOTE: I used banana frosting. 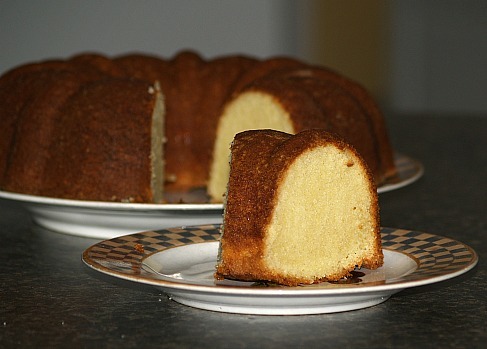 Among homemade cake recipes, this simple cake recipe was very popular years ago when everyone did their laundry on Mondays with the old ringer washers. It was a busy day and usually a pot of soup beans would be cooking on the stove all day for the evening meal. 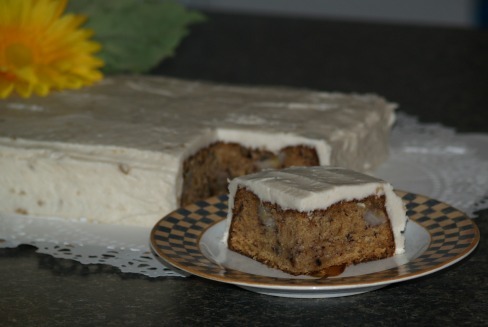 Simple desserts like this spice cake recipe were quickly prepared and ready for evening also. By the time for evening dinner, most homemakers were too tired to worry about cooking so they planned the dinner early in the morning. Grease and flour 9 inch square baking pan. Heat milk and butter to boiling point; set aside. Beat eggs until creamy; beat in sugar and vanilla. Beat in the flour, baking powder and salt. Slowly add the milk and beat until blended. Pour batter into prepared pan and bake 20 to 25 minutes or until pick comes out clean. Remove cake from oven and turn on broiler. Mix topping and spread on hot cake; return to oven to brown under broiler. 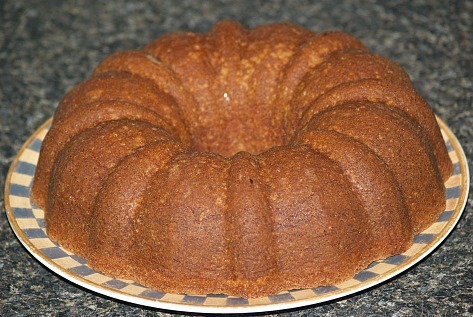 Preheat oven to 325F degrees; grease and flour Bundt pan. In a large mixing bowl cream butter and sugar; add eggs one at a time beating after each. Add flour alternating with the milk to creamed mixture while beating. Add lemon and almond and beat well; pour in prepared pan. Bake for 1 hour or until pick comes out clean.